​Join today to play in the Earth Week Compassion Games! Sign Up Today! Designed to inspire compassionate action in the spirit of co-opetition (competing to cooperate) the Compassion Games provide the world with a unique and fun way to accomplish important goals. Cities, schools, businesses large and small, individuals, and even the California Institution for Women's prison "play" to prove they are the most compassionate until proven otherwise. The Compassion Games "get the edge on compassion" to inspire us all to go farther, reach higher, touch deeper and together create a State of Compassion. Mobilizing our communities into acts of altruism and compassion through service is an amazing way to activate citizens into the beloved community. Fun and creative ways to ignite and catalyze compassionate action in communities around the world. Competition becomes coopetition as we challenge one another to strive together to make our planet a better place to live. Join the Annual September Games (9/11-9/21), participate in Serve The Earth Week (April 18-26), Back To School (10/15-25) and/or World Interfaith Harmony Week (2/1-2/7). In this fun and creative way, we can show the world that California is the Most Compassionate State in the World, until proven otherwise, and we will help other states try to beat us! Be on a team, lead a team, teachers lead your class or school, businesses use as team building activity, or play by yourself. Clean the beach, paint over graffiti, read to a child, sit with the elderly, meditate on compassion- whatever you call compassion, it's Game On! When you post your action on the Compassion Map, the world can see your compassion. 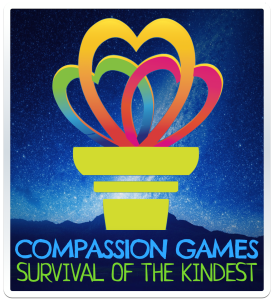 Register to play at the Compassion Games website. Compassionate California supports and helps all California efforts to play in the Games.